Prime Minister Shri Narendra Modi made a very significant observation regarding the magnificent electoral mandate from the people of UP, Uttarakhand, Manipur and Goa, which came half way through his first term in office. He said, “these victories, where the voter has expressed his resounding endorsement is the laying of the foundation of a New India”. The PM was addressing the mammoth victory rally at the BJP head quarters on Ashoka Road, New Delhi on March 12. The historic performance of the BJP in these polls, which one national daily headlined as “Modi’s March”, was seen as the party stealing a head-start for the 2019 polls. Modiji gave a clarion call for a samarth, sresht Bharat by 2022, when India completes 75 years of independence on this occasion. He passionately reiterated the commitment to serve the poor, build India of the dreams of Deendayal Upadhyaya, whose centenary year happens to be the year the BJP grabbed the stunning three fourth majority in the UP assembly poll. Modiji has won the heart of India by winning UP and Uttarakhand that shook the confidence of his opponents. 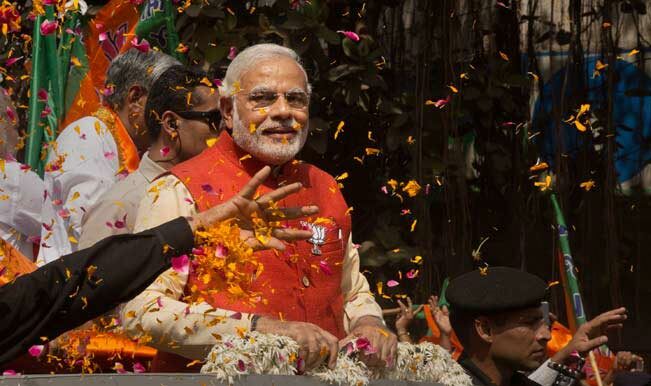 Of the five states that went to polls BJP swept two and came close to majority in two others. It established Modi as the most popular, most respected leader of India, prompting Economic Times to banner its lead “ghar ghar Modi”, saying Rang de basanti Narendra Modi works wonders winning hearts in the heartland and cementing his stature as the most popular leader in the country. An emphatic splash in Uttarakhand and a stunning run in Manipur sent the Opposition running for cover. “Namo passes DeMo test with flying colours,” ET added. PM in fact repeated the 2014 show in UP, Congress got Punjab winning 77 seats in the 117 member assembly and the ambitions of AAP was dashed both in Goa and Punjab. India is surely and firmly Modified at last. There is great pride and happiness in stating this. Because though the modification happened actually in May 2014, and again in the state elections in October same year, Indian media, anti-BJP intellectual and political class remained self-deluded believing it a temporary voter aberration. So they failed to notice the tumultuous saffron tide building up in the last many months and hoped the drowning cycle held by the shaky hand will push the tide back and it will be game as usual. What Prime Minister Narendra Modi and BJP President Shri Amit Shah have achieved in this round of election has no parallel and this has finally and convincingly consolidated the gains of the past three years making everybody acknowledge the BJP as the party of India’s future. In all but two of the five states that went to polls the BJP has made big gains. In UP 325 seats out of 403 and 57 out of 70 in Uttarakhand and 21 seats in Manipur where the party had no member in the assembly are historic gains. In Goa and Manipur the BJP is likely to form governments with other smaller parties and independents. Everywhere but in Goa the BJP substantially increased its vote share. The huge success in UP where the party is coming to power after a gap of 15 years is creating a national buzz in favour of BJP. Omar Abdullah who is no friend of the BJP told his friends in the anti-BJP camp not to try to replace BJP in 2019 as it is impossible but concentrate on elections in 2024. Lalu Yadav blamed Nitish Kumar for not campaigning against the BJP in UP. Akhilesh Yadav blamed the voters who according to him got swayed by the Prime Minister. Mayawati who was reduced to just 19 seats in UP and failed to open account in Uttarakhand where BSP played king maker in the past five years blamed voting machines for her humiliating defeat. She cannot get elected to Rajya Sabha when her term comes to an end early next year and is facing a prospect of political oblivion. Akhilesh Yadav who was the media tiger taking on BJP is reduced to 47 seats, less than the number of his clansmen occupying positions in his party of the family. The Congress is reduced to an all time low of seven seats in the assembly of which three have come from family turf Rae Bereily, where too it lost six of the ten seats. In Rahul Gandhi’s Amethi Congress lost all seats. The SP and BSP lost in all there strongholds. It was a resounding verdict against caste and communal and dynastic politics. It was a verdict for Modi whom the people saw as a messiah of the sole ideological pole to transform India as the super power of the century. Those who abuses Shri Modi were punished by the voter. Those who unleashed a campaign of calumny bit the dust. Those who built their campaign spreading falsehood on demonetization lost the people’s trust. The BJP could win the polls only because of the great performer, Vikas Purush image of the PM and the meticulous hard work of the party chief Shri Amit Shah. 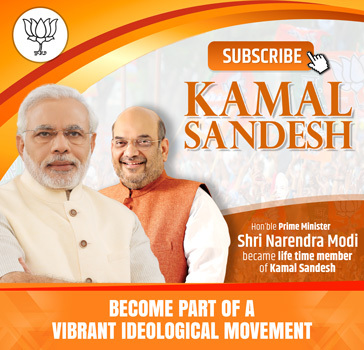 The massive parivarthan yatras reaching up to the panchayat level, activating the booth level committees, enrolling millions of active workers in the rural areas, training the party cadre in which over three lakh workers participated, all under the close scrutiny of Shri Amit Shah created the climate for the BJP electoral success. No other party has not put in this sort of mobilization in the last two years. The central schemes like Mudra yojana in which over 33 lakh loans worth Rs 12,275 crore was distributed, in UP alone, similarly free cooking gas connection to 52 lakh families and 40 million Jandhan accounts all convinced the people the sincerity of Modi government on poverty eradication. Similarly over 3 lakh families received loans under Prime Minister’s Aawas Yojana. The loan waiver promise the party made was a big hit. The poor have embraced Modiji but parties and leaders who worked on vote banks without creating any hope for raising the living standards of the poor could not fathom the Modi connect. Modiji spoke in a modern idiom. His opponents still spoke the language of the sixties. Shri Modi emphasized on delivery. His opponents on promises of freebies. The BJP has changed the matrix of political discourse, its opponents worked on caste, religious arithmetic. The opposition built their campaign on opposition to note ban, but the poor figured it as a decisive and bold effort to curb black money fight corruption and usher inclusive growth. Today the BJP is ruling two third of the country’s population. Since 2014 the party snatched power in nine states seven of them from Congress, whereas the Congress lost power in nine states and gained in one- Punjab. The victories this round make it possible for the party to raise its strength to 70 and Congress strength down to 47 in the Rajya Sabha, The BJP will be in a position to elect its own President and Vice President without much help from others outside the NDA. With this round too won, the detractors of Modiji, Amit Shahji and the BJP will have to work harder and re-chart their moral standing if at all they have to be taken seriously by the people. For, their style of politics has simply become outdated. (The author is a senior journalist and political analyst.